Personally, I think there is nothing cuter than a baby in a helmet, but if we can prevent the need for one, we probably should go that route . . .
Plagiocephaly, or flat head syndrome, occurs from baby’s positioning in utero or positioning after birth. It is often called positional plagiocephaly. When there is repeated pressure on one spot of the skull, plagiocephaly can occur. It is very common and also, very treatable. Because newborn babies have a malleable skull, meaning they have soft spots and bones that are not completely fused yet, the skull can be formed into shapes other than round fairly easily. The purpose for the malleable skull is to allow for growth. Your baby’s brain will literally double in weight in one year due to new synapses between neurons if they get plenty of stimulation. The un-fused skull allows for this growth, but can also allow for a mis-shaped head when too much pressure is on one specific area. The best way to assess the shape of your baby’s head is to look at it from the top. It is important to note that one reason for the malleable skull is to allow the baby through the birth canal. Don’t be alarmed if your baby’s head is shaped like a cone when they are born vaginally. This is not plagiocephaly, it is simply due to the pressure of the birth canal and this will typically resolve within a few days or weeks at the most. It is also important to note that plagiocephaly does not affect the child’s mental development, as the brain is very protected. Babies with plagiocephaly may have a secondary condition called torticollis. This is a tightness of one side of your baby’s neck muscles. This is often caused by the position in utero and you can identify this by noting how your baby turns his head. Does he always look one direction, and does it seem like his neck is stiff and uncomfortable if you try to turn his head the other way? This contributes largely to plagiocephaly and if you suspect this, you should let your baby’s healthcare provider know right away because he may require occupational therapy or physical therapy to release those tight muscles and work on positioning. Premature babies are at higher risk for plagiocephaly because they often spend extended periods of time in one position in an incubator in the NICU. In 1992 the American Academy of Pediatrics came out with the recommendation that all babies sleep on their backs in the “Back to Sleep Campaign” to decrease the chance of sudden infant death syndrome (SIDS). While the incidence of SIDS decreased, the incidence of positional plagiocephaly dramatically increased. Let’s talk about treatment first, then I will talk about what parents can do to prevent plagiocephaly. Once your child is able to sit and stand, the prolonged pressure on his head is mostly eliminated and the head will become more round naturally, then their hair will cover any remaining flat spots. For pre-term babies and very young babies a gel pillow can be utilized to decrease the pressure on the skull. Another option is the Tortle, which is a hat that prevents the baby from turning his head so that pressure is not allowed on the flattened part of the skull. If changing the baby’s positioning and use of a gel pillow or Tortle is not effective and your baby’s child care provider diagnoses your baby with plagiocephaly, they may refer your baby to a pediatric neurosurgeon. The pediatric neurosurgeon will fully evaluate your child, take specific measurements and possibly refer your baby to an orthotist. The orthotist will probably make a mold of your child’s head and fabricate a helmet that is customized to your baby’s head and specifically designed to achieve symmetry. According to the American Association of Neurological Surgeons, helmets are most effective between three and six months of age, but correction is still possible up to 18 months, it might just be a longer process. It will be recommended that your baby wear the helmet at all times, removing it only for baths. Allow your baby lots of supervised tummy time from the day she is born. We recommend 5 minutes several times per day as newborns and up to 20 minutes a few times per day for three-month-old babies. Carry your baby in vertical baby carriers and slings. This relieves pressure from your baby’s head and also has the added benefit of keeping your baby close to you to help with bonding, learning new language, and processing the world from the vertical position, building balance and equilibrium. Hold your baby upright on your shoulder whenever possible. When holding your baby and feeding your baby, try to change position from right side to the left side so pressure on his head is symmetrical. This is also great for your baby’s developing vision. Re-arrange your baby’s room or the position of her crib or bassinet, so she looks in a different direction. Babies typically look toward the light source or toward the door, anticipating you coming in. Try to eliminate time spent in baby carriers, car seats, and bouncy seats. Hold your baby or use a baby carrier whenever possible. Try to leave the car seat in the car. 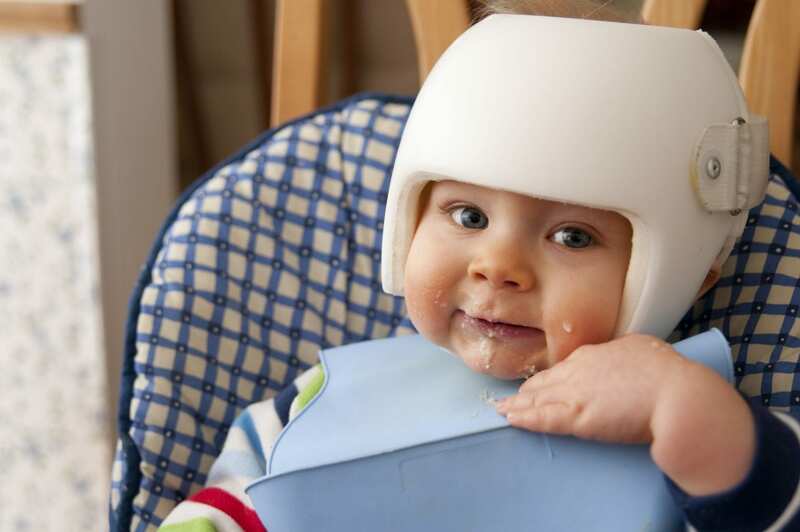 Remember, plagiocephaly is very common and very treatable, but it is important to get intervention quickly. Don’t wait and hope that it resolves on its own.